Having gone to every one of the annual manatee festivals held, I can safely say this was the COLDEST and BEST one ever. Two days of winds, clouds on Saturday, and sunny Sunday, folks flocked to see Three Sisters Springs crowded with manatees looking to stay warm in the beautiful spring waters. It was like magic. 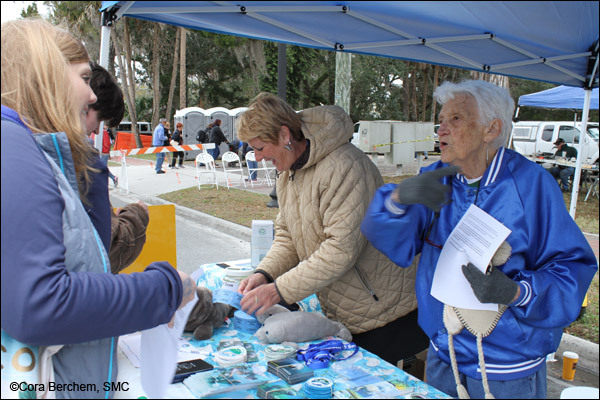 Cold days didn’t keep the manatee fans away from the 2018 Crystal River Manatee Festival. Helen Spivey, co-chair of SMC’s Board of Directors, and Trinket Mason (r-l) kept busy at the Club’s education table. Crowds flocked through the lines of festival booths, and many were so enthralled with the beautiful, clever items offered, they didn’t get to the free buses in time to see the hundreds of manatees in Three Sisters Springs. Alas, they missed the buses but were happy anyway. Our Save the Manatee booth was crowded with volunteers helping people to meet their dream of having a manatee photo, a calendar, or adopting a manatee, getting a T-shirt, and on and on. Volunteers (r-l) Cora Berchem, Helen Spivey, and Trinket Mason speak to many interested visitors throughout the festival. Then there’s Hope – Save the Manatee Club’s giant blow-up manatee. The joy of the children as they hide in the eel grass at her base, then peek out to get their pictures taken with her. Another popular photo-op was an upright piece of plywood with two different face holes cut out to accompany two painted manatees. Mostly children became manatees, but suddenly they were putting their doggies’ faces in the holes, then their mom and dad’s, and a few grandmas and grandpas on their knees with their faces poked in the manatee face holes. 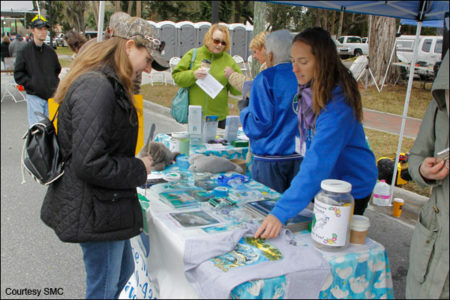 It was very cold with bitter winds, yet it was a delightful manatee festival. 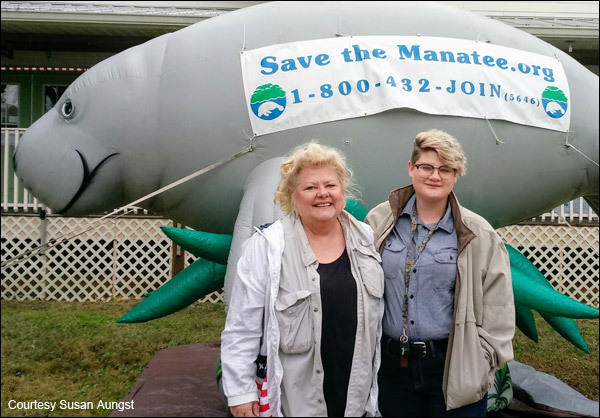 Volunteer Susan Aungst (left in photo) and her niece Hannah, take a moment for a photo opp beside Hope, the giant inflatable manatee. Volunteer Coordinator’s Note: This year’s Volunteer Team included Helen Spivey, co-chair of SMC’s Board of Directors, Cora Berchem, Susan Aungst, Hannah Aungst, Melissa Sunshine, Kelly Miller, Daria and Nicolas Johnson, Mary and Omar Bourassa, Sandra Boyd, Trinket Mason, Stephanie D’Amico, Craig Rouse, Jacylnn Merk, Janneke Bogyo, and Sue Carey Lindholm.